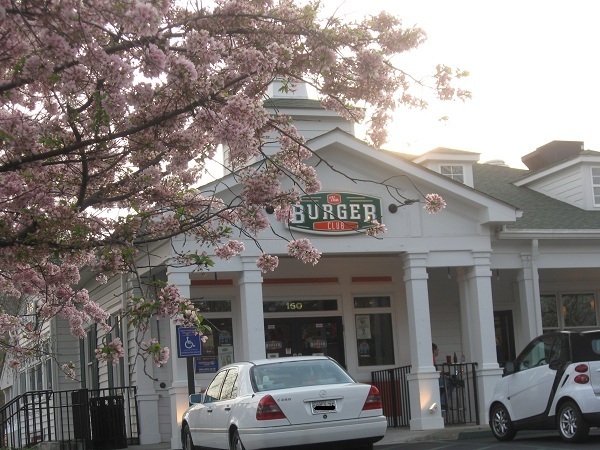 The Burger Club, Vinings GA (CLOSED) – Marie, Let's Eat! Perhaps unjustly absent from the ongoing tales I tell on this blog is a sense of history and place. We live in the northern suburbs of Atlanta, a town with many very good restaurants but few claims to culinary originality and superiority. Atlanta in fact has almost no claims to a solid tradition in any one style of dining. The city is a jack of all trades, but a master of none. Except hamburgers. There is not a population center anywhere in this country with as many excellent burger joints as Atlanta. I could write about nothing but burgers here for months and not scratch the surface. The Wall Street Journal agrees that, between Ann’s Snack Bar and The Vortex, we’re untouchable. That’s not to say that better individual burgers might not be out there in your own town – in point of fact, take thirty bucks to a little place I know in Vermont in the summer and you will be served a burger so many times superior to any you’ve ever had that you will weep, knowing the game is over – but shack for shack and joint for joint, the batting average of Atlanta beats the hell out of any other city in America. We’ve come up with some pretty crazy concoctions to enhance the beauty of burgers in this town. 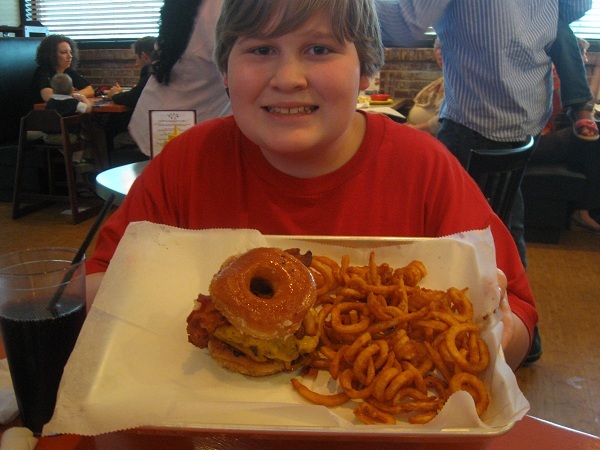 It’s certainly enough to grill or fry a perfect patty, but only in Atlanta would somebody come up with the Luther Burger, which dispenses with the bun and serves the patty between two halves of a Krispy Kreme doughnut, and named for crooner Luther Vandross. Mulligan’s, the joint that came up with the recipe, closed a few years ago, but not before giving their seal of approval to Turner Field to continue the tradition at Braves games. Over the last decade, while perfecting their recipes for perfect burgers and debating the merits of angus versus kobe beef, a few places have also tinkered with oddball experiments like the Luther. Over in Vinings, the Burger Club, a family restaurant run by the team behind the upscale Paul’s and Social Vinings, has a dozen or so weird and wonderful house specialties on the menu. Among them, their own take on the Luther. Called the Artery Annihilator, this doughnutty mess also includes bacon and cheese. No, I didn’t order one; I’m in rotten enough shape as it is and don’t want my arteries annihilated. Fortunately for us all, my son was in town this week. So the Burger Club moved into a space vacated by an Atlanta Bread Company that had been there forever. It’s on Paces Ferry Road, right in the heart of Vinings, next door to the fire station. It’s slightly separate from the Vinings Jubilee open-air mini-mall, where my bored crowd of high school punks would often go on Friday evenings in the late ’80s after we’d been kicked out of Cumberland. The parking lot has space for about two dozen Smart cars, or two Cadillacs. Since my parents wanted to take their precious grandson to supper, but drive nothing but Cadillacs, parking was a challenge. Me, I had the Gastro Pub Burger, which is served with bacon and a blend of red onion marmalade and Roquefort cheese, with tater tots on the side. The burger was indeed a good one, but heaven only knows why I can’t resist these darn tots. Perhaps because I just had onion rings the day before, I passed on those, but surely any of their sides would have a little more oomph to them than a bag of frozen Ore-Ida brand tots, no matter whether I sprinkle a little salt on them or not. In fact, my dad, who, like my mother and Marie, just had a basic beef burger without any of the specialty trimmings, said that his onion rings were among the best he’s ever had. Then again, he always eats his onion rings with Heinz 57 sauce. Nobody has a lot of sympathy for that. But my son, well, he had his arteries annihilated. He was last heard muttering something about a “perfect blend of savory and sweet” before lapsing into a coma. Normally I’d have a bite, but I’m trying to cut down on the life-ending things. Back when I was making mistakes in 2004, though, I’d probably have had a dozen a day. It was that kind of year. Posted on April 6, 2010 July 29, 2017 by Grant G.Posted in atlanta, burgers, georgia, goodbyeTagged atlanta, burgers, closed!, georgia, vinings.